Welcome to my second Christmas blog tour of this week, The Holiday Homes Tour, hosted by 11 Magnolia Lane and Evolution of Style! These ladies are so talented and I’m so very excited they asked me to join this tour again, along with another extremely talented group of bloggers! If you’re joining me from Paige of The Pink Clutch, welcome to my home, and welcome to CitrineLiving! I love Paige’s fabulous style, I am such a huge fan! Everyone on the tour this week has so many fabulous ideas and tons of inspiration to share, please make sure to head over to see them all – you’ll find them linked at the bottom of my post. 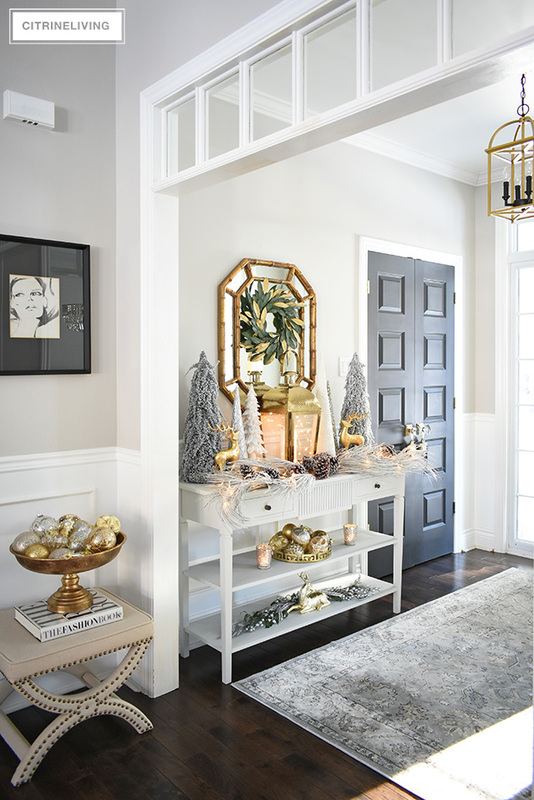 When I decided on my entryway Christmas decorating this year, I wanted the look to be elegant and sophisticated, using beautiful silvers and golds for an element of luxe. Most of my Christmas decorating will follow suit (I’m still working on it, I’m very behind this year! ), and I’m very excited to see how it all comes together. I’ll be sharing room by room, as I did last year, so stay tuned for a lot of posts coming your way over the next month! 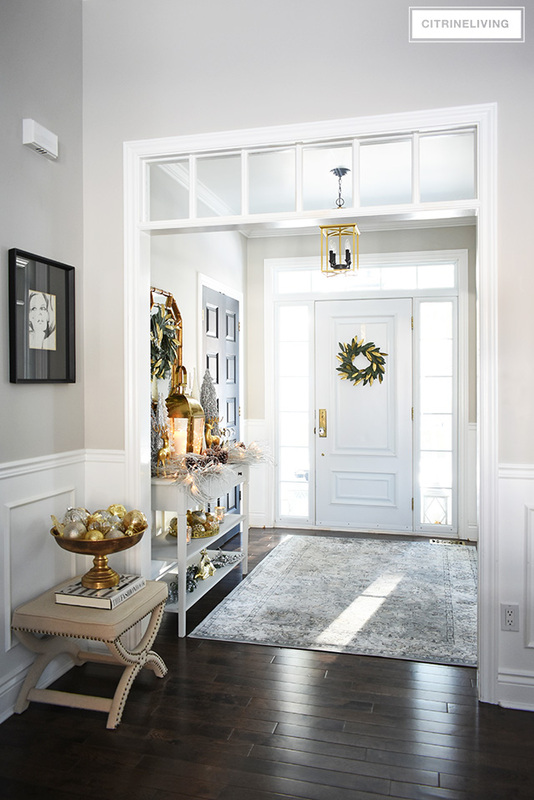 For now, please come in, I’ll walk you through our entryway decked out for the season. 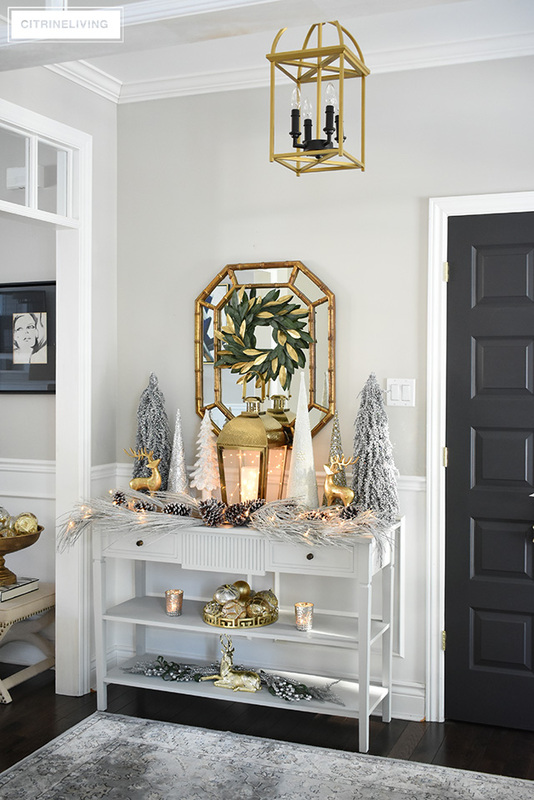 Last year for this tour, I shared our Christmas porch (see it here), and today, I’m sharing our entryway decked out for the season. 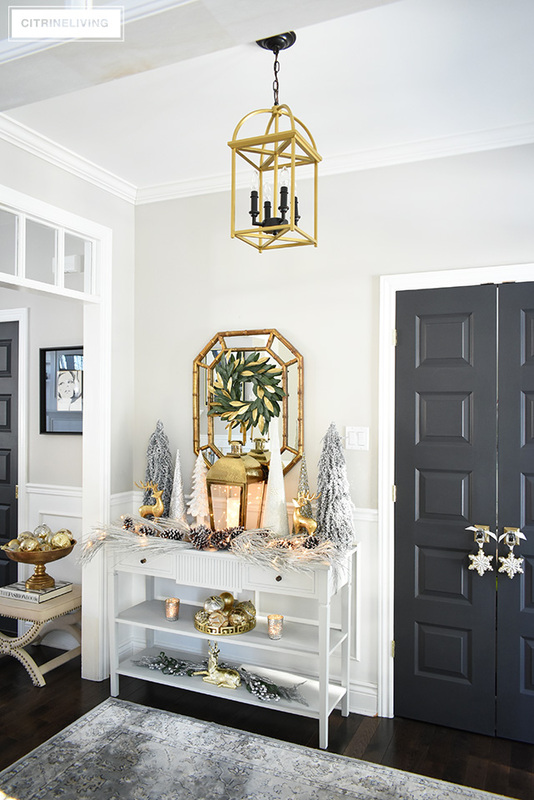 Our home is open concept and our entryway opens onto our dining room – in case you missed my Christmas tablescape earlier this week, you can see it here, and get a good idea of how these two spaces flow. Last year, I used a heavily layered look in this space, which I loved, the look incorporated many of my blue and white chinoiserie pieces (see it here), as did all of my Christmas decor. 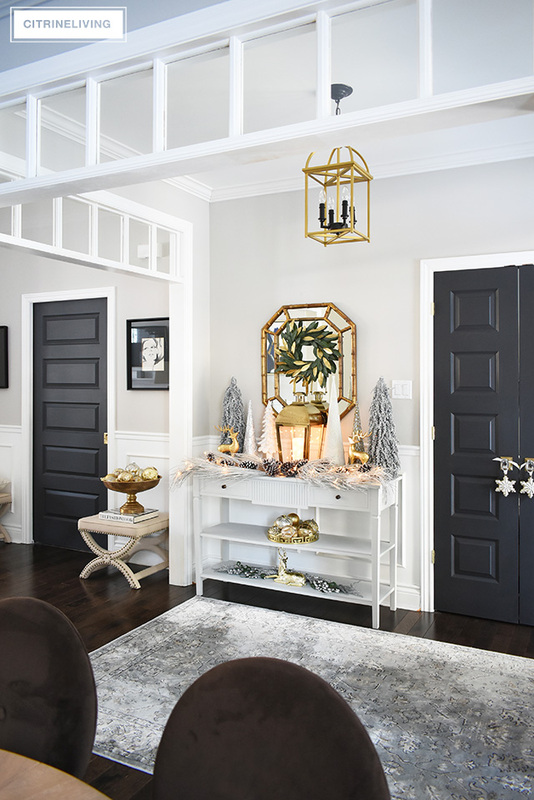 Our home has undergone many updates and makeovers over the last year, and I’m so thrilled to see all our new spaces dressed up for the holidays this year. 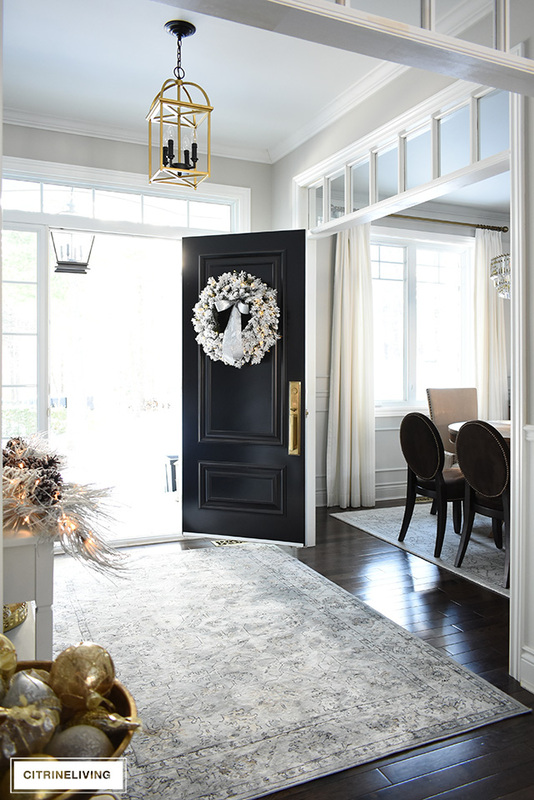 I decided to hang my flocked wreath on our front door to welcome our guests this year, and paired with our new brass door hardware from Emtek (more on that in a bit! ), it set the tone for the look of our entryway. I also incorporated some greenery with my faux magnolia green and gold wreaths for a hit of color. I used fresh greenery on my tablescaoe in the dining room as well (see it here), and I just love the combination of the warm and cool metals against the green. 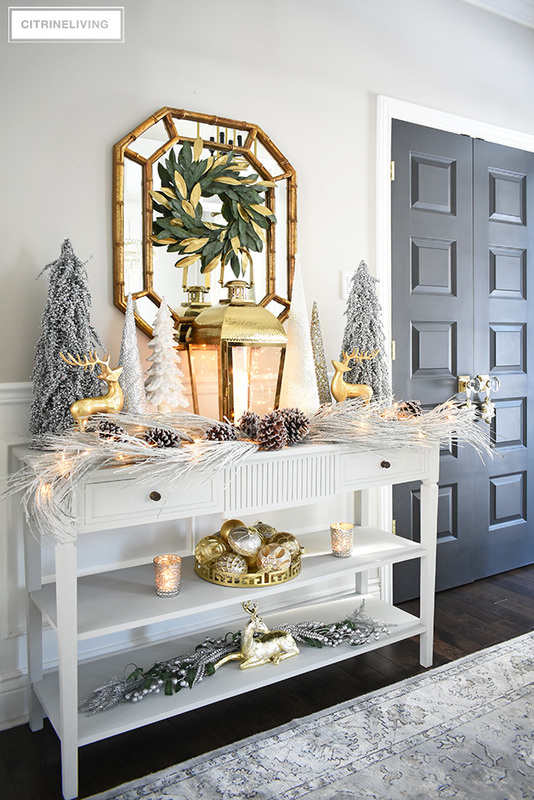 I set a magical wintery scene on our console table with my frosted pine sprigs, metallic and snowy trees, and reindeer. 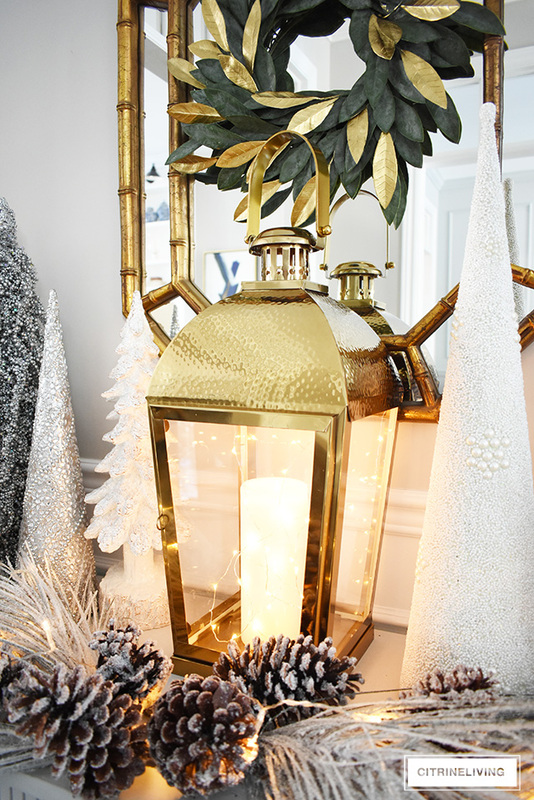 Lit up with twinkly lights and my brass lantern, I don’t think it gets more magical than that! 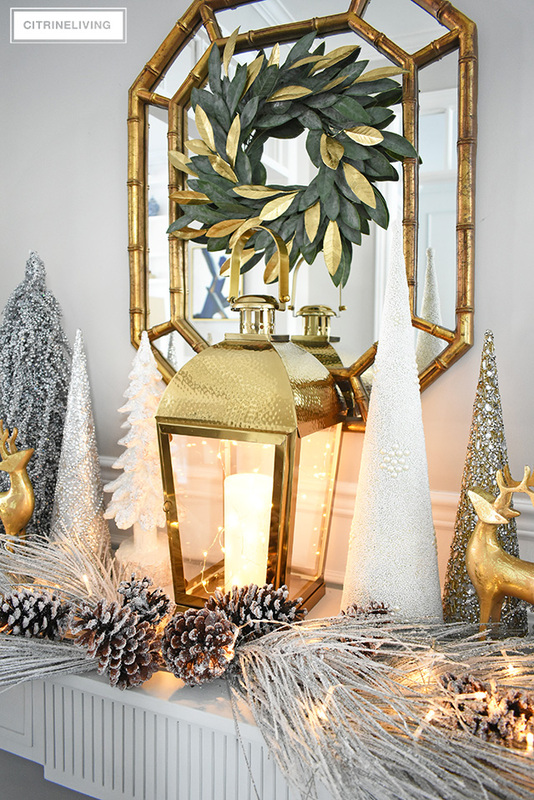 I used a collection of silver and gold ornaments arranged on my greek key brass tray as a simple way to layer in more Christmas decor, keeping the look from getting too cluttered. 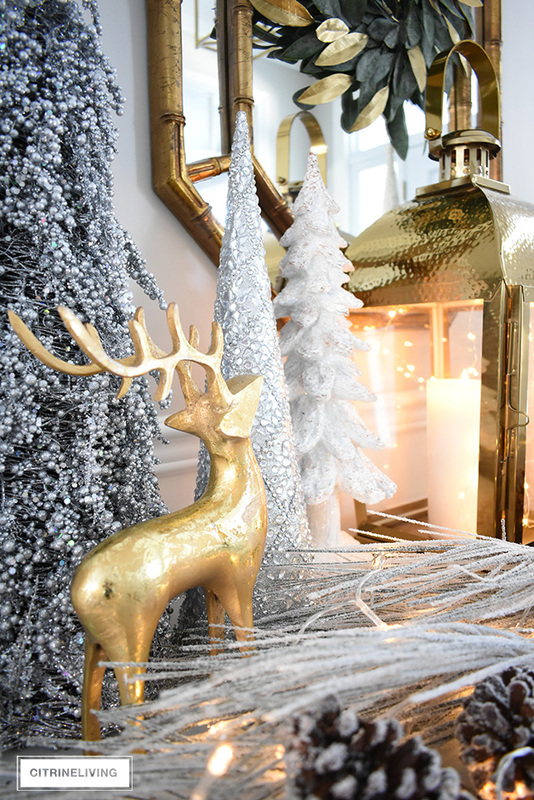 And of course, my cute little gold reindeer, lounging amidst more greenery and metallic sprigs on the bottom shelf, completes this wintery vignette. I strung the lights through the frosted pine sprigs and also inside the lantern for added twinkle and sparkle. My footed gold bowl is filled with more ornaments to carry the look into the house. 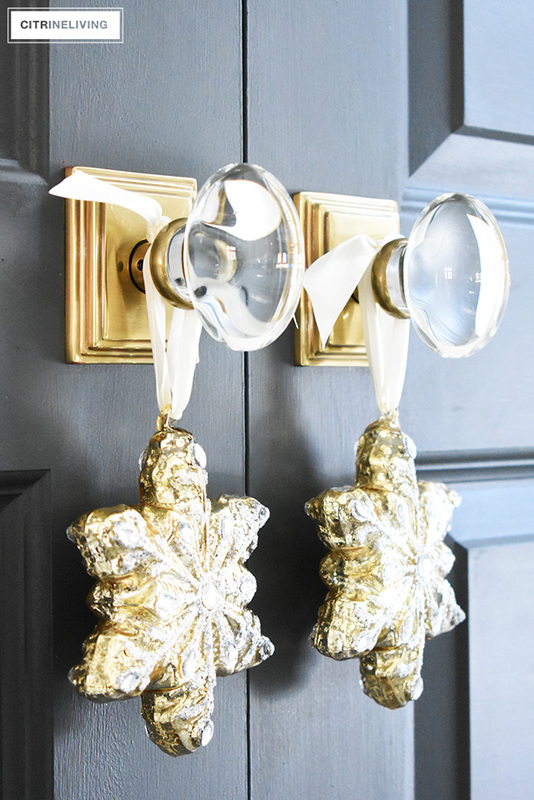 I hung a pair of embellished glass snowflakes with ribbon, from our new Hampton glass doorknobs (with Wlishire rosettes, in French Antique, also from Emtek), to bring in a little something sparkly, and contrast our black closet doors. 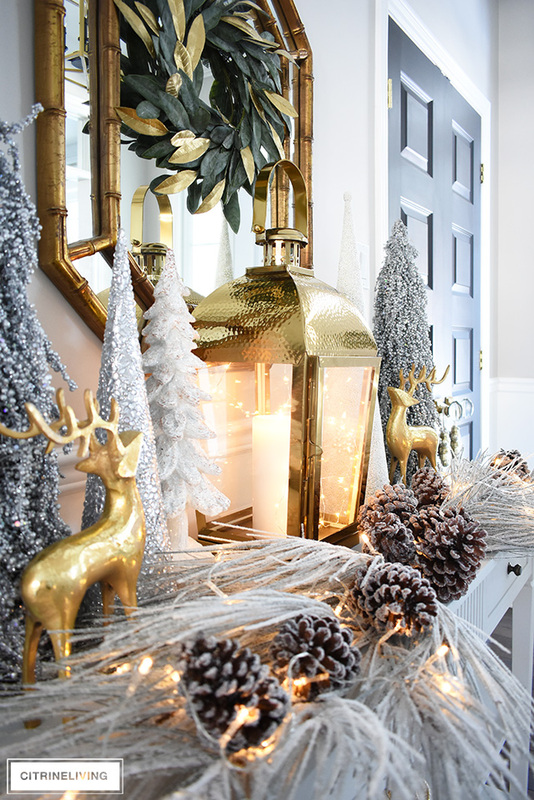 I’m loving all the luxe layers of silver and gold and the subdued palette. Getting back to our front door, and it’s new brass and glass hardware, I am so in love with how much it elevates the look of our door, and our home. We’ve installed these Hampton knobs throughout, and they are fabulous. You can see them in my latest living room reveal (click here), adorning our back patio french doors. 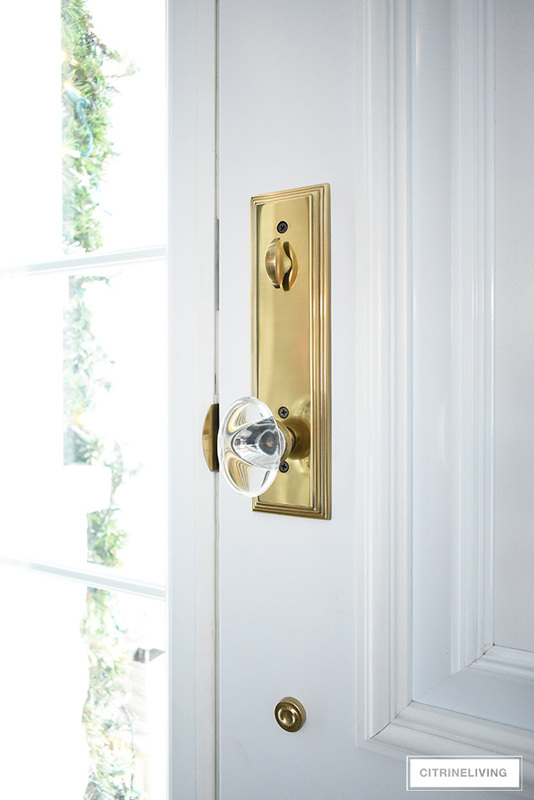 Here’s a closer look at the gorgeous details on this hardware, we absolutely love it! 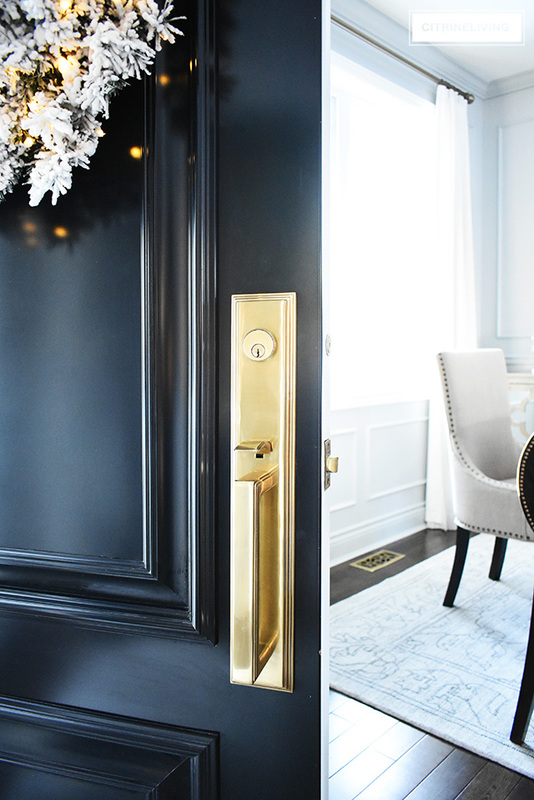 The brass details against our door also echo the light fixture (which I painted gold myself, years ago), and truly elevate the look of our entryway. 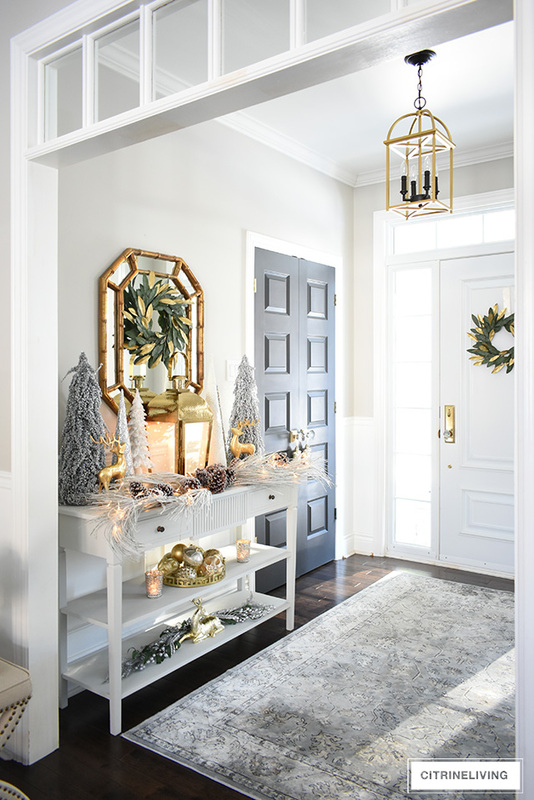 That wraps up my entryway Christmas decorating, thank you so much for reading with me today, I hope you enjoyed your stay and found some inspiration for your Christmas decorating this season. Now, I just have the rest of my house to decorate! Hello this is absolutely stunning!!! Where is the foyer rug from? Thank you! Thank you very much!! I’m thrilled you like it! 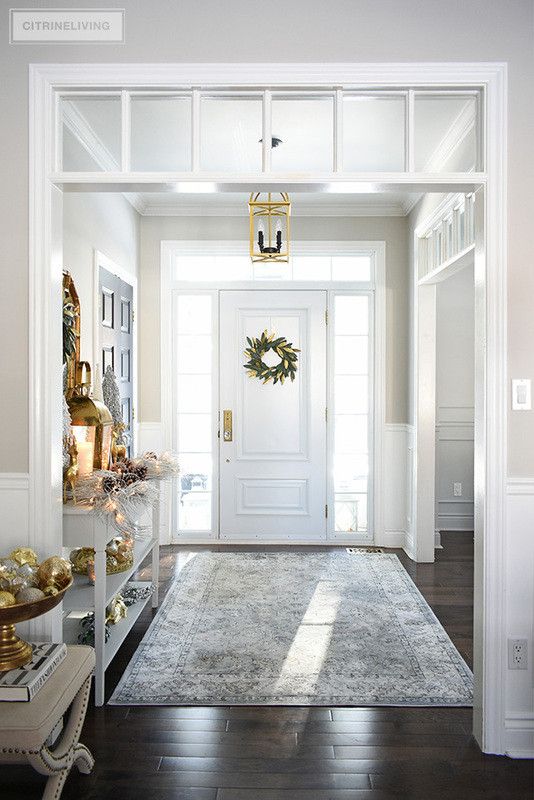 The rug was a lucky find from HomeSense, but I have other similar ones linked in this post and also under the SHOP tab, SHOP MY ENTRYWAY. 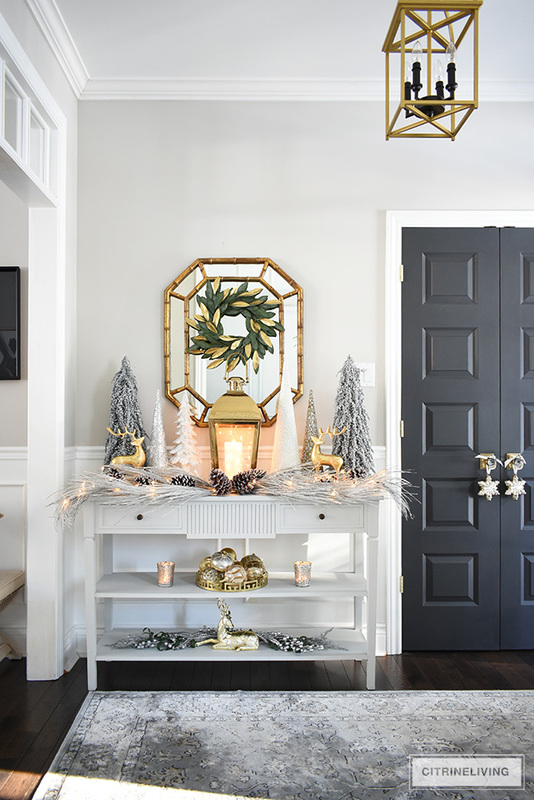 Such a fabulous entryway! And I love your new hardware as well! Merry Christmas! Thank you so much, Julie!! I’m so glad you like it all! Merry Christmas to you too! OMG! I thought last year’s decor was stunning, but this is amazing! Thank you very much Candy! I am so thrilled you like it!! Merry Christmas!